Rea Bray was born on January 30, 1902 in Kansas, a son of James Pascal “J. P.” Bray and Mattie Gertrude (Carrier) Bray. In July of 1920, Bray was riding his motorcycle near Garfield Park in Topeka, Kansas, with a young lady perched on the tank, when a policeman signaled for him to stop. He didn’t and a 20-block chase ensued before the young couple was overtaken by pursuing officers. Two people on his motorcycle had proved to be more of a handicap than he had thought it would be. It took Bray about an hour to raise the $10 bail money it took to get him released from jail. The name of the young lady on the motorcycle is unknown but Bray was married first at Wichita, Kansas in 1920 to Ethel Virginia White, who gave her address on the marriage license as Denver, Colorado. Early in 1922, Bray and a partner, Ernest Rodecker, opened the Bray & Rodecker Auto Repair Co. on the southeast corner of 7th and Jackson Streets in Topeka. Bray was married second to Eula M. Bray before 1930 but nothing more is known about Eula except that she was born c1908 in Missouri. Finish: Bray ran the 3rd fastest 2-lap time in time trials of 1:15,2 which was only slower than the times run by Elfreda Mais of Indianapolis, Indiana and Harley Wells of St. Joseph, Missouri who was driving the Ackerman special. Bray finished 2nd in the 5-mile consolation race behind Willard C. Prentiss of Denver, Colorado in the #2 Star special. Feature race winner: Oscar Anderson of Iron Mountain, Michigan who was driving a red Fiat #1. May 31, 1926 – 1 mile dirt oval – Overland Park at Denver, Colorado – Sanctioned by the Overland Park Racing Association (O. P. R. A.). Finish: Bray finished 2nd in the 5-mile consolation race behind Willard C. Prentiss of Denver, Colorado in the #2 Star special. July 5, 1926 – 1 mile dirt oval – Overland Park at Denver, Colorado – Sanctioned by the Overland Park Racing Association (O. P. R. A.). Finish: Bray finished in the money and gained 35 points in the season point standings but just where he finished in what race is currently unknown. Feature race winner: Chester “Chet” Gardner of Denver, Colorado in the #8 Gardner special. July 17, 1926 – 1 mile dirt oval – Overland Park at Denver, Colorado – Sanctioned by the Overland Park Racing Association (O. P. R. A.). Finish: Bray finished in the money and gained 25 points in the season point standings but just where he finished in what race is currently unknown. Finish: Bray ran the 5th fastest lap in time trials of 30.8 which was slower than the laps run by Vic Felt, John Bagley, Howard Wills and Willard C. Prentiss. Bray took a job as a patrolman on the Hutchinson, Kansas police force in 1928. He worked nights primarily as a motorcycle patrolman although he drove patrol cars during inclement weather. He had a colorful career for about three years, dividing his time between traffic enforcement and bootlegging investigations. He was quick (at least by today’s standards) to shootout the tires of those who chose to flee from prosecution. During that time, he continued to drive his racing cars. Finish: Bray set the fastest time in time trials with a one-lap track record of 33.4 seconds. Bray finished 4th in the 1st heat race behind Mack McAnally of Winfield; James F. Pickens of Arkansas City, Kansas; and James E. Snyder of Arkansas City, Kansas. Bray finished a close 2nd place behind James F. Pickens among the 6 cars that started the 8-lap 3rd heat race. Finish: Bray finished 2nd to Albert “Al” Koepke of Topeka in the 10-mile race. Bray finished 2nd to Rex Edmonds of Houston, Texas in the straw-hat derby. Bray finished 5th behind Albert “Al” Koepke; Phineas C. “Dad” Harrier; Barney Oman of Los Angeles, California; and Rex Edmonds of Houston, Texas in the 50-mile feature race. September 6, 1928 – ½ mile dirt oval – Ottawa County Fairgrounds at Miami, Oklahoma – Sanctioned by A. A. A. Finish: 4,000 fans saw Bray finish 3rd in the 1st heat race behind Vern McComb of St. Joseph, Missouri and 8.2 seconds behind John Boling of Cushing, Oklahoma who finished in 2nd place. McComb collected $125 for the victory. Bray finished 3rd behind Harley Wells of St. Joseph, Missouri who was driving the Bammel special owned by Lee Bammel of Taylor, Texas and just a fraction of a second behind 2nd place finisher, Earl Hovenden of Duncan, Oklahoma who was driving the dual overhead cam #K-1 Fronty Ford owned by Leonard Kerbs of Otis, Kansas in the 2nd 10-lap heat race. Bray finished in 2nd place, 8.4 seconds behind Earl Hovenden of Duncan, Oklahoma in the 3rd 10-lap race. Bray finished in 2nd place, 6.6 seconds behind Henry Donica of Cardin, Oklahoma in the 8-lap consolation race. Bray lost a tire early in the 24-lap Grand Sweepstakes race but still managed to finish in 4th place behind Vern McComb of North Chicago, Illinois in the Lawhon special owned by the Lawhon Brothers of St. Joseph, Missouri; Earl Hovenden of Duncan, Oklahoma driving a dual overhead cam Fronty Ford special owned by Leonard, Kerbs of Otis, Kansas and Harley Wells of St. Joseph, Missouri who finished 3rd driving the Bammel special owned by Lee Bammel of Taylor, Texas. McComb collected another $450 from the $800 total purse for his victory in the sweepstakes. September 8, 1928 – ½ mile dirt oval – Ottawa County Fairgrounds at Miami, Oklahoma – Sanctioned by A. A. A. Finish: 2,000 spectators saw Bray finish in 2nd place, just .4 seconds behind Harley Wells of St. Joseph, Missouri who was driving the Bammel special owned by Lee Bammel of Tayler, Texas in the 10-lap 3rd heat race. Feature race winner: Earl Hovenden of Duncan, Oklahoma. Finish: 15,000 spectators saw these races but Bray’s name is not listed in the published results. Finish: “An overflow crowd” saw these races but Bray’s name is not listed in the published results. Finish: Bray finished in 3rd place in a 5-mile heat race. September 20, 1929 – ½ mile dirt oval – Kansas State Fairgrounds in Hutchinson, Kansas – Sanctioned by I. M. C. A. Finish: Bray tied with Emery Collins for 1st place in time trials. Their lap time of 31.0 seconds each also tied the track record already held jointly by Charles Lebsack and Leonard Kerbs, both of Otis, Kansas. Bray was credited with 6th place behind Emory Collins, Percy Ford, Herb Segal, P. H. Hoffman and Spec Heminger after dropping out of the 9-lap championship race on the fifth lap. Finish: Bray won the first 5-mile heat race in 4 minutes, 1.0 seconds finishing 22.0 seconds ahead of L. L. Neff of Winona, Kansas. Bray followed Bill Epps of Oakley, Kansas for 1 lap in the second 5-mile heat race before Epps dropped out with a broken camshaft. Bray went on to win that race in 4 minutes, 5.0 seconds finishing 4.0 seconds ahead of L. L. Neff. Bray won the 10-lap sweepstakes race in 8 minutes, 29.0 seconds which was 5.5 seconds ahead of 2nd place finisher L. L. Neff. The total purse for the days races was $500. October 20, 1929 – 1 mile dirt oval – Ar-Sar-Ben at Omaha, Nebraska – Sanctioned by I. M. C. A. Finish: Bray finished 3rd in the 10-lap feature race behind Bert Ficken and Hamp Cox. July 4, 1930 – ½ mile dirt oval – Arkansas City Speedway a.k.a. West Madison Speedway at Arkansas City, Kansas – Sanctioned by A. A. A. Finish: A small crowd watched Bray run the 2nd fastest time in time trials of 31.2 seconds which was .4 seconds behind Pat Cunningham who had the fastest time of the day. Bray collected $35 from the purse for finishing 3rd behind Pat Cunningham and Cokey Fuller in the 1st 10-lap heat race. He finished on only 3 wheels, 10.4 seconds behind Fuller who was .2 seconds behind Cunningham. Bray was paid $75 for finishing 1st in the 2nd 10-lap heat race in which he beat Jimmy Davis of Duncan, Oklahoma by 12.2 seconds. Bray ran the 10-lap distance in 5 minutes, 17.2 seconds which was a new track record for that distance that still stands. Bray finished 2nd to Pat Cunningham in the 16-lap “Kanotex & Shell Refinery Sweepstakes” race. Bray’s time was 8 minutes, 30.0 seconds which was 4 seconds slower than Cunningham. Bray’s share of the purse for finishing 2nd in this race was $175. July 25, 1930 – ½ mile dirt oval – Bo Stearns Track north of Wichita, Kansas – Sanctioned by A. A. A. Finish: Bray finished in 2nd place in the 5-mile 1st heat race for the 6 fastest cars from time trials. Pat Cunningham won that race in a Gallivan Ford. Bray also finished a close 2nd behind Pat Cunningham in a special 6-lap race. Bray suffered a blown tire in the 25-lap feature race which caused his Fronty to spin completely around in a 360° circle before finally coming to a stop. There was enough damage that his car was unable to complete the race which was won by Lawrence Hughes. Finish: Bray suffered a broken shoulder in the 1st heat race when he was involved in a 4–car accident in which Ben Galiano (or Gagliano) of Kansas City, Missouri was fatally injured. Finish: Bray won the 2nd 5–mile heat race in 4 minutes, 43.0 seconds. September 15, 1930 – ½ mile dirt oval – Kansas State Fairgrounds in Hutchinson, Kansas – Sanctioned by I. M. C. A. Finish: Bray set the quickest time of the day in time trials with a new track record for 1–lap of 30.8 seconds. 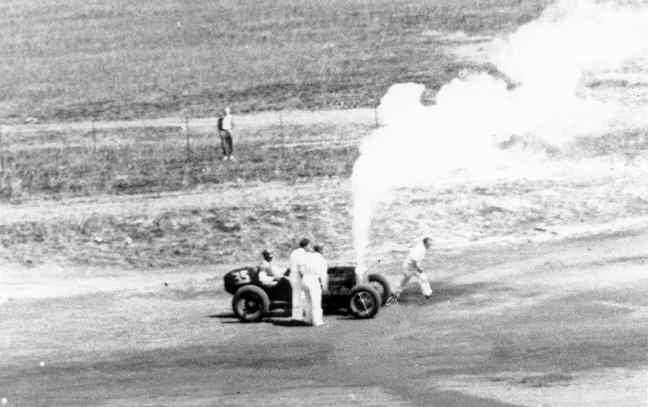 Bray dropped out of the 7–lap North American Sweepstakes when a piston went through the side of his engine block. He went to downtown Hutchinson, retrieved his #4 Bray special Fronty Ford and returned to the racetrack in time to start the 9–lap North American Sweepstakes race in which he finished 2nd to Archie Powell of Galesburg, Illinois. September 19, 1930 – ½ mile dirt oval – Kansas State Fairgrounds in Hutchinson, Kansas – Sanctioned by I. M. C. A. Finish: Bray set the 2nd fastest time of the day in time trials running 1–lap of 30.4 seconds in the #7 Hill special Fronty Ford. Bray then set the 3rd fastest time of the day in time trials running 1–lap in 30.8 seconds in his #4 Bray special Fronty Ford. Since he could only run 1 car after qualifying, he chose to race the #7 Hill special Fronty Ford. Bray finished 2nd in the featured dash which was a 1–lap race for the 3 fastest cars in time trials. Archie Powell won this race followed closely by Bray and Jimmy Trainor of Los Angeles, California. 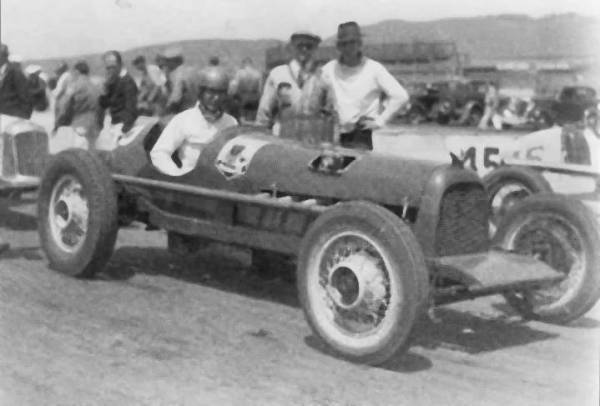 Bray finished 2nd in the 1st 7–car, 7–lap heat race behind Archie Powell who led all the way although Bray managed to pull up beside Powell on every straightaway. Bray won the 2nd 7–car, 7–lap heat race in 3 minutes, 43.6 seconds. Curley Young of Denton, Texas finished in a distant 2nd place. Bray won the 7-lap sweepstakes race by “almost 100-yards” over Gene DeMont of Memphis, Tennessee. Finish: Bray’s name does not appear in the published results of these races. July 5, 1931 – 1 mile dirt oval – Ar-Sar-Ben at Omaha, Nebraska – Sanctioned by I. M. C. A. Finish: Bray set a new 1-lap track record in time trials for one lap with a time of 29.8 seconds, only to have it broken later in the day by Tex West who also set a new 1-lap track record of 28.6 seconds. Bray won the 3-car, 4-lap 3-cornered race in 2 minutes, 10.5 seconds. Bray finished 2nd to Tex West in the 6-car, 6-lap 1st heat race. Bray finished 2nd to Tex West in the 9-car, 10-lap Grand sweepstakes race. September 1, 1931 – ½ mile dirt oval – Valley County Fairgrounds at Ord, Nebraska – Sanctioned by I. M. C. A. Finish: Bray ran the 7th fastest in time trials with a lap of 30.25. Bray finished 3rd in the 3rd heat race that was won by Fay Gardner. Bray finished 4th in the main event that was won by John Gerber of Stanwood, Iowa. Finish: Bray turned in the 4th fastest in time trials with a lap of 29.83. Bray finished 3rd in the fourth heat. Bray finished 9th in the main event that was won by John Gerber of Stanwood, Iowa. Finish: Bray finished in 3rd place in the 10-lap 1st heat race behind Pat Cunningham and Lew Irwin of Iola, Kansas. Bray won the 10-lap consolation race in 4 minutes, 15.0 seconds. Finish: Bray’s name is not listed in the published results of these races. Car: #7 Hill special Fronty Ford owned by Russell D. Hill but these races were canceled due to rain. September 25, 1931 – ½ mile dirt oval – Kansas State Fairgrounds in Hutchinson, Kansas – Sanctioned by I. M. C. A. Finish: Bray had trouble with Hill’s #7 Fronty so he borrowed a #4 Frontenac from Murray Earl for the first 10-car, 7-lap heat race. He did not finish well in that race and did not enter any of the other races this day. September 27, 1931 – ½ mile dirt oval – Andrews County Fairgrounds at Savannah, Missouri – Sanctioned by I. M. C. A. Finish: Neither Bray’s, nor Hill’s name appears in the published results of these races. Finish: Bray won the 3-mile class A heat race in 3:18.6. Note: Bray was both the promoter of this event and a participant as well. July 3, 1932 – ½ mile dirt oval – Fair Park Track at the Old Oklahoma State Fairgrounds in Oklahoma City, Oklahoma – Sanctioned by I. M. C. A. Finish: These races were postponed until July 10, 1932 due to rain. July 10, 1932 – ½ mile dirt oval – Fair Park Track at the Old Oklahoma State Fairgrounds in Oklahoma City, Oklahoma – Sanctioned by I. M. C. A. Finish: Bray won the 6-car, 5-mile “Southwest Sweepstakes” race and, thus, was crowned the “Southwest Champion”. 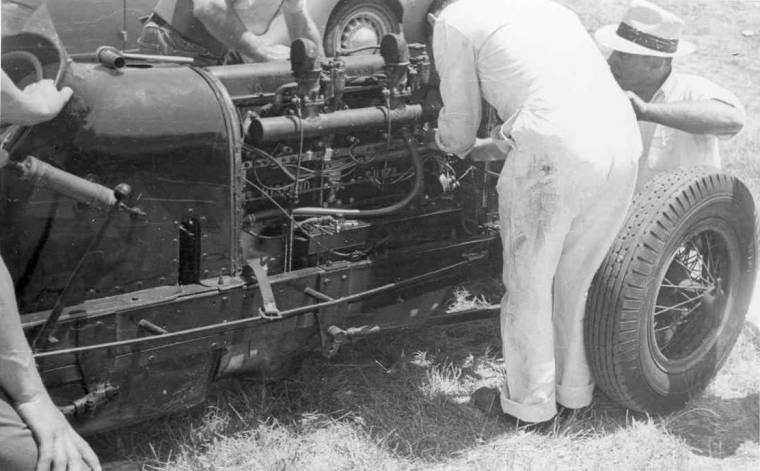 Note: Roy Gillihan of Purcell, Oklahoma was fatally injured when his car overturned 3-times and then was struck by a car driven by Bill Mathews of Ft. Smith, Arkansas on the 1st lap of the championship race. Mathews was uninjured. Finish: Bray tied for 11th fastest time of the 24 cars that took time trials with his 1 lap of 33.2 seconds which was 1 full second slower than the fastest time of the day. Those who timed in faster than Bray did were: Ted Davis, Verne Ellis, Pat Cunningham, Lew Irwin, Murray Earl, Harley Wells, Bill Weber, James E. White, Roy Lake, and Jack Kannapel. H. H. Morris tied Bray for the 11th fastest time. Bray won the 3rd heat race. Finish: Bray won the 1st 8-lap heat race in 4:32.0. Feature race winner: Howard “Speed” Adams of Rock Island, Illinois. Finish: Bray’s lap of 32.5 seconds was the 7th fastest of the day in time trials behind John Gerber, Sam Hoffman, Fred Dresselhuys, Emory Collins, Clarence Haskell, and Herbert Palmer. Bray finished 8th in the feature race behind John Gerber, Sam Hoffman, Fred Dresselhuys, Emory Collins, Clarence Haskell, Lew Irwin and Lloyd Palmer. August 26, 1932 – ½ mile dirt oval – Iowa State Fairgrounds in Des Moines, Iowa – Sanctioned by I. M. C. A.
September 3, 1932 – ½ mile dirt oval – Minnesota State Fairgrounds at Hamline, Minnesota – Sanctioned by I. M. C. A. Finish: Bray entered these races but his name is not listed in the published race results and it is unlikely that he even made to these races. Finish: Bray finished 10th in the feature behind Maynard “Hungry” Clark, John Gerber, Pat Cunningham, Bill Carroll, Rex Edmonds, Chris Petersen, Wesley Caster, Al Banks and Art Martinson. Finish: 8,000 spectators saw Bray finish in 6th place in the 6-car, 10-lap 3rd heat race behind Ted Davis of Junction City, Kansas; Bill Carroll of Lewis, Kansas; Herb Hunter of Hoisington, Kansas; Glen Dunlap of Newton, Kansas and Speck Heminger of Hastings, Nebraska. September 28, 1932 – ½ mile dirt oval – Fair Park Track at the Old Oklahoma State Fairgrounds in Oklahoma City, Oklahoma – Sanctioned by I. M. C. A. Finish: Bray won the 5-lap consolation race over Ray LaPlant of Newark, New Jersey. Finish: Bray finished in 2nd place in the 1st heat race behind Lew Irwin. Bray finished in 2nd place in the 5-lap handicap race behind Lew Irwin. Bray finished in 2nd place in the 15-lap sweepstakes race behind Lew Irwin. Finish: Bray finished 1st in time trials. Bray won the 1st heat race. Bray won the sweepstakes race finishing ahead of Tom Bricker of Decatur, Illinois. August 19, 1933 – 1 mile dirt oval – Missouri State Fairgrounds in Sedalia, Missouri – Sanctioned by I. M. C. A. Finish: 16,000 spectators saw Bray finish in 2nd place in the 6-lap, 5th heat race behind Rex Edmonds of Dallas, Texas. August 21, 1933 – ½ mile dirt oval – North Iowa Fairgrounds at Mason City, Iowa – Sanctioned by I. M. C. A. Finish: 5,000 spectators saw Bray finished 2nd in the consolation race behind Red Sorenson of Milwaukee, Wisconsin. August 25, 1933 – ½ mile dirt oval – Iowa State Fairgrounds in Des Moines, Iowa – Sanctioned by I. M. C. A. Finish: Bray finished in 4th place behind Port DeFraties of Springfield, Illinois; Oscar Coleman of Dallas, Texas; and Charles Pauley of Herington, Kansas in the 5-mile consolation race. Finish: Bray finished in 3rd place behind Red Campbell and W. A. Tasker in the 4th 10-lap heat race. Finish: Bray finished in 6th place in the 10-lap consolation race behind Lew Irwin; Pete Alberts of Chicago, Illinois; Charles Pauley; Bob Wilson of Kansas City, Missouri; and Art Challender of Rock Island, Illinois. September 24, 1933 – 5/8 mile dirt oval – Industrial Speedway at Dallas, Texas – Sanctioned by S. R. A.
September 27, 1933 – ½ mile dirt oval – Love Field at Dallas, Texas – Sanctioned by S. R. A.
September 30, 1933 – ½ mile dirt oval – Fair Park Track at the Old Oklahoma State Fairgrounds in Oklahoma City, Oklahoma – Sanctioned by I. M. C. A.
December 24, 1933 – 5/8 mile dirt oval – Industrial Speedway at Dallas, Texas – Sanctioned by S. R. A.
Rea Bray had moved to Wichita, Kansas by 1934. August 31, 1934 – ½ mile dirt oval – Iowa State Fairgrounds in Des Moines, Iowa – Sanctioned by I. M. C. A.
September 22, 1934 – 1 mile dirt oval – Cumberland Park at Nashville, Tennessee – Sanctioned by I. M. C. A.
Rea Bray had moved to Topeka, Kansas by 1936. Finish: Bray qualified 9th fastest in time trials with a lap of 26.04 which was slower than the times turned in by Duke Dinsmore, Lloyd Axel, Clyde Gilbert, Red Campbell, Everett Saylor, Morris Musick, Ben Musick, and George “Joie” Chitwood.. Finish: Bray finished in 4th position in the 5-mile consolation race behind George “Joie” Chitwood of Topeka, Kansas; Gene Frederick of Dallas, Texas and Dan McCloskey of Kansas City, Missouri. 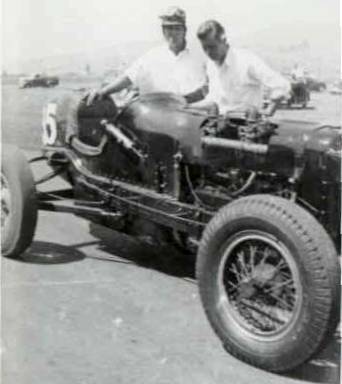 Bray was awarded the 14th place finishing position in the 20-lap feature race behind Howard “Howdy” Cox, Everett Saylor, Morris Musick, Lloyd Axel, Mike Salaly, Ted Davis, Clyde Gilbert, Gordon Chard, Cecil “Dutch” Dorris, Lyn Musick, George “Joie” Chitwood, Gene Frederick and Dan McClosky. September 5, 1936 – ½ mile dirt oval – Minnesota State Fairgrounds at Hamline, Minnesota – Sanctioned by I. M. C. A. Finish: Bray entered these races but his name is not listed in the published race results that have been located to date. 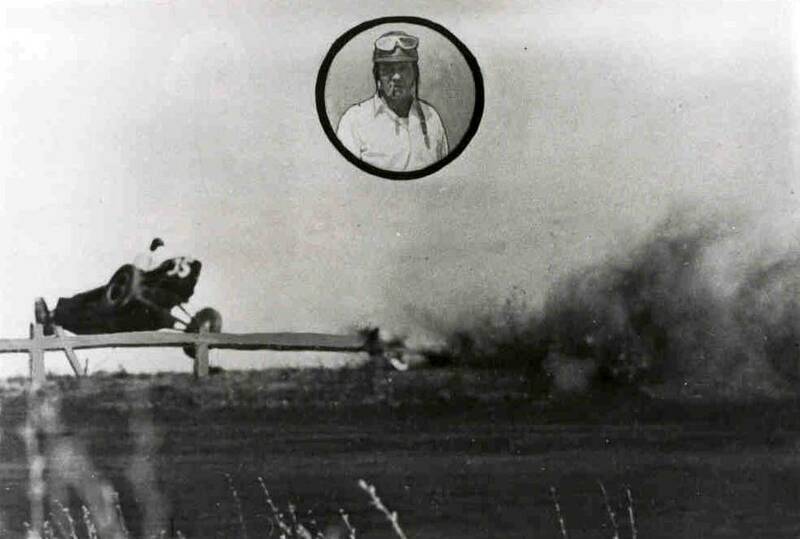 September 21, 1936 – ½ mile dirt oval – Kansas State Fairgrounds in Hutchinson, Kansas – Sanctioned by I. M. C. A. Finish: Bray was 8th fastest in time trials behind Ben Musick a.k.a. “Bill Morris” of Denver, Colorado; Oscar Coleman of Dallas, Texas; Morris Musick of Lincoln, Nebraska; Lou Brown of Champaign, Illinois; Chyde Gilbert of Longmont, Colorado; George “Joie” Chitwood of Topeka, Kansas and Waldo Barnett of Hutchinson, Kansas. Bray finished in 5th place in the 2nd 6-car, 5-lap heat race behind Clyde Gilbert; Morris Musick; George “Joie” Chitwood and Waldo Barnett. Bray finished 2nd in the 8-car, 5-lap consolation race behind Tex West. Bray finished last in the 8-car, 10-lap State Fair Sweepstakes race behind Ben Musick a.k.a. “Bill Morris”; Oscar Coleman; Morris Musick; Lou Brown; Clyde Gilbert; George “Joie” Chitwood and Tex West. July 17, 1937 – ½ mile dirt oval – Anthony Downs in Anthony, Kansas – Sanctioned by S. R. A.
August 27, 1937 – ½ mile dirt oval – Iowa State Fairgrounds in Des Moines, Iowa – Sanctioned by I. M. C. A. Finish: Bray finished 2nd in one of the preliminary races behind Gus Schrader but it has yet to be learned just which preliminary race that was. August 28, 1937 – 1 mile dirt oval – Missouri State Fairgrounds in Sedalia, Missouri – Sanctioned by I. M. C. A. Finish: Bray timed in somewhere between 6th and 8th fastest in time trials. Bray finished in 4th place behind Buddy Callaway; Shorty Drexler of Columbus, Ohio and Tom Slattery of Chicago, Illinois in the 1st 8-car, 5-mile heat race. Bray finished in 3rd place behind Clay Corbitt of Atlanta, Georgia and Cecil Burnaugh of Columbus, Ohio in the 2nd 7-car, 5-mile heat race. September 3, 1937 – ½ mile dirt oval – Iowa State Fairgrounds in Des Moines, Iowa – Sanctioned by I. M. C. A.
September 17, 1937 – ½ mile dirt oval – South Dakota State Fairgrounds at Huron, South Dakota – Sanctioned by I. M. C. A. Finish: Bray finished 1st in the 3rd heat race. Rea Bray had moved to Los Angeles, California by 1939 and opened his own auto repair garage. April 2, 1939 – 1 mile high banked paved oval – Oakland Speedway at San Leandro, California – Sanctioned by A. R. A. Finish: Bray finished in 2nd place behind Ray Gardner in the 44-lap Spring Sweepstakes race. April 30, 1939 – 1 mile high banked paved oval – Oakland Speedway at San Leandro, California – Sanctioned by A. R. A. Finish: Bray finished 4th in a 100-mile Classic race behind Wally Schock, Rajo Jack and Lloyd Logan. September 24, 1939 – 1 mile high banked paved oval – Oakland Speedway at San Leandro, California – Sanctioned by A. R. A. Finish: Bray led the 1st lap of the 2nd annual 33-car, 500-mile Classic race before dropping back to finish in 5th place. Bray finished 2nd in A.R.A. points in 1939 behind champion Wally Schock. March 10, 1940 – ½ mile dirt oval – Madera Speedway at Madera, California – Sanctioned by C. O. D. A. Finish: The results of these races have yet to be located. May 12, 1940 – 1 mile high banked paved oval – Oakland Speedway at San Leandro, California – Sanctioned by A. R. A. Finish: Bray’s name does not appear in published results of the 100-mile race run on this day. September 2, 1940 – 1 mile high banked paved oval – Oakland Speedway at San Leandro, California – Sanctioned by A. R. A. Finish: Bray’s name does not appear in published results of these races. July 4, 1941 – 1 mile high banked paved oval – Oakland Speedway at San Leandro, California – Sanctioned by A. R. A. Finish: Bray finished in 5th place in the 200-mile race behind Hal Cole of South Gate, California; Wally Schock; Rajo Jack and Tex Sanders. September 1, 1941 – 1 mile high banked paved oval – Oakland Speedway at San Leandro, California – Sanctioned by A. R. A. Finish: While running in 7th place on the 356th lap of a 33-car, 500-mile race, the crowd, estimated to be 15,000 saw Bray sail over the south fence. He suffered a broken neck when he was thrown from the car and, thus, he became the 10th fatality in the history of that racetrack. Rea Bray is buried beside his maternal grandparents in the Foster Cemetery at Topeka, Kansas.